New York architecture firm REX has placed the last piece in the World Trade Center masterplan by unveiling its design for the Ronald O Perelman Performing Arts Center. The Perelman Center, as it is better known as, was created as a significant cultural hub for the area, hosting theatre, dance, music, film and opera performances. REX composed a fittingly arresting design – a simple, pure orthogonal form clad in glistening translucent, veined marble. Nestled between the WTC site’s towering high rises, the centre may at first appear relatively low and modest in comparison. Yet its design scope and ambition is anything but. The architects researched extensively to find the perfect form and orientation to fit the surroundings and site constraints. As a result, the new building is rotated and elevated to accommodate complex underground requirements and to work in harmony with the 9/11 memorial nearby. Its external simplicity is matched by a selection of robust, hardworking materials inside – steel walls, concrete trusses, wood floors, plywood panels – and a well thought out program to boot. REX aimed to create a centre that is flexible, functional and modern, able to accommodate even the most demanding performance requirements. The layout is planned across three levels, explain the architects: ‘Public (bottom), Performer (middle) and Play (top)’. Within these, there are three auditoria, rehearsal areas, ample backstage and support areas for the performers, as well as public functions, such as a restaurant and bar, lobby lounge and information point. 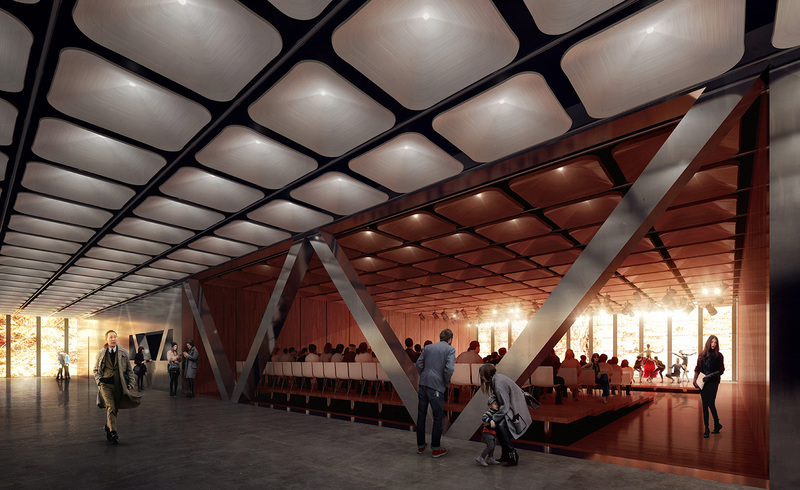 Adding an injection of art and culture to what is arguably one of New York’s most important ongoing sites, the Perelman Center is scheduled to open its doors in 2020.